Remember back to art class in 3rd grade? It may be a long time ago but I think that everyone has seen or used a color wheel. Q. What exactly is the color wheel? A. 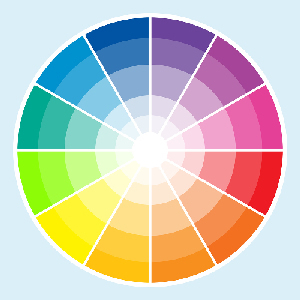 It is a tool which describes the relationships between colors. A. Oh yes, all color is relative. That is, every color is defined to a degree by the company of the other colors it keeps. Just like your mother told you that you’d be judged by who you decided to pal around with…it’s sorta the same with color. Let’s talk about how the wheel works. Here are two wheels, at the outside rings are the colors at their purest, unadulterated by anything else. Color pros call color in this state “high chroma” or “high intensity”. On the first wheel, each of the successive rings show the colors as they have black added to them. Note how they get more and more muted as they get darker. What is happening? You are taking the color at its purest and toning it down by adding black. Colors with black added are called tones. On the second wheel, each of the colors has white added. Again, they are more and more muted even though they are getting lighter, they are not getting brighter but they are getting lighter. Anytime you add a color to another, the colors have to get more muted…it's the law! Colors with white added are called tints. 1) Complimentary - Complimentary colors are opposite each other on the wheel, red/green, blue/orange, yellow/violet. Nothing makes a color look more like itself than when it is opposed by its compliment. Complimentary color schemes are the most lively. 3) Monochromatic – Monochromatic schemes are ones which use tints and tones of the same color. A monochromatic scheme is the most restful of all. Like any tool, the color wheel responds to the skill of its user. The relationships between colors on the wheel never change. Like a musician, the beginning player will read every note literally, working tightly within the framework of the notation. The more experienced player is able to use the notation as a base for embellishment and refinement. I wouldn’t expect anyone with beginning color knowledge to be able to construct a sophisticated color scheme...but I do know that a little knowledge and a good tool can get you to a comfort zone which is waaaay better than picking colors willy nilly. The color wheel has been around for a very long time because it works, and it will work for you.